Oh joy, it's deja vu! The study spawning the headlines - A High-Fat Meal Increases Cardiovascular Reactivity to Psychological Stress in Healthy Young Adults - was published in the Journal of Nutrition. The "high fat meal" in question? A breakfast from McDonald's consisting of an Egg McMuffin, a Sausage McMuffin and 2 hash browns. Junk science meets junk journalism again - it makes great headlines, but doesn't do a thing to advance our knowledge base, except maybe to point out what makes science "junk." I saw this and hustled over to McDonald's nutrition calculator. 81 grams of carbs for breakfast. Yeah, I bet they developed problems! Never let it be said that modern media let the facts get in the way of a good story. Thanks for the graph Regina. It's a doozy. As soon as I noticed that it was a McDonald's breakfast, I had a feeling that we were dealing with a high-carb and high-fat breakfast. And the fat isn't of the good saturated kind from coconut, palm, and olive oils and grass-fed meats. It's trans fats and polyunsaturated fats. Junk science for sure. Interesting graph. Did you construct it yourself from tables in the report (I could not find it there)? Mostly I wonder if the graph would show the same basic relationship if all countries were included. The chart was made with four "low saturated fat" intake and four with "high saturated fat" intake. 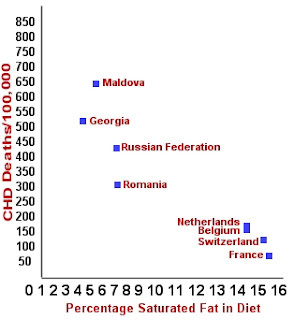 Not all countries were included (obviously)....but the four countries that consume the highest levels of saturated fat have significantly less CHD than the four I cherry-picked (admittedly) with the lowest levels of saturated fat in their diet. Being in a rush, I just made a quick chart with total fat intake in an Excel sheet.. for all available countries in the PDF where data was complete for both CHD deaths (1998) and fat intake (1995 or so I think I picked). Percentage of fat intake seems to be inversely associated with CHD deaths pretty much over the board. Of course, we all know how little this really means ;) Still, it's interesting. Eastern Europe, Obesity Among Highest in Europe! What's so Special about Protein Anyway?